The easiest way to spend the night at Lake Baikal is to spread out the sleeping bag and to pitch one's tent. Several people try their luck by asking locals for accommodation. They can often spend the night in a typical siberian framehouse for a small fee. Not far from Kultuk in the small village Angasolskaja there is a small trubasa. From the cabin you have great views over Lake Baikal and the old transsiberian line section. 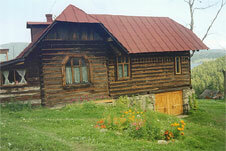 It has some shared rooms, a small kitchen, a typical russian washing room and a toilet with views over the lake. The housing estates Schumucha and Ulanowo offer some more accommodation facilities. You may also find an overnight stay about 10 kilometres south of Port Baikal. In Port Baikal there are a lot of cheap accommodation facilities, especially since the old transsib line section has been put into operation again. The most curious places the spend the night are probably old transsib railway-cars. 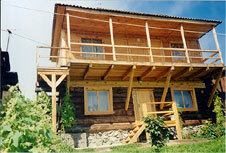 The guest house is located in Port Baikal in a cove of the Angara river, on the level of shaman rock. 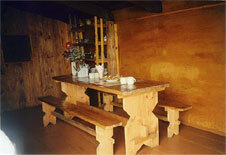 It consists of a two-storied framehouse with a lot of rooms for two up to six guests. The house has got a feature fireplace, a banja, a small tennis court and a pool table. They also offer full board and horse rides by request. This guest house is perfect choice for all those who don't want to spend all their time at Lake Baikal and all those who want to get away from the turbulences in Listvyanka. From here you can do lovely walking tours along the old transsib line section. You take the bus from Irkutsk to the ferry pier in Listvyanka. From there you go to Port Baikal by ferry. Please note that the ferry crosses quite seldom in winter. (8 am, 4 pm, 6 pm). In Summer it is possible to go to Port Baikal from Irkutsk directly by "Raketa" (speed boat) as well as by train on the transsib line section. However, the regular trains from Sludjanka travel at quite abnormal times. The special train for tourists travelling on weekends is very slow and probably not everyone´s cup of tea.